"This dish is so simple to make - easy, creamy, dreamy chicken!" Clean chicken breasts and season with salt, pepper and garlic powder (or whichever seasonings you prefer) on both sides of chicken pieces. Bake for 25 minutes, then add cream of chicken soup and bake for 10 more minutes (or until done). Serve over rice or egg noodles. 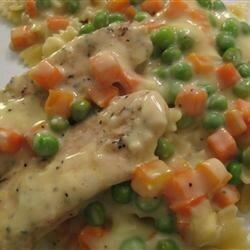 Chef John's simple chicken and cream sauce tastes terrific over toast. This was too bland, it definitely needs carrots, peas and more spices.